MarketSaw - 3D Movies, Gaming and Technology: Kevin Durant, LeBron James, Peter Parker: The Top Basketball Players Of This Generation! Kevin Durant, LeBron James, Peter Parker: The Top Basketball Players Of This Generation! Is this a spoiler? Yes this is a movie clip from THE AMAZING SPIDER-MAN but it doesn't reveal any serious plot details other then highlighting Parker's new found super skills. Your call. I watched it. One of the world’s most popular characters is back on the big screen as a new chapter in the Spider-Man legacy is revealed in The Amazing Spider-Man. Focusing on an untold story that tells a different side of the Peter Parker story, the new film stars Andrew Garfield, Emma Stone, Rhys Ifans, Denis Leary, Campbell Scott, Irrfan Khan, with Martin Sheen and Sally Field. The film is directed by Marc Webb from a screenplay written by James Vanderbilt, based on the Marvel Comic Book by Stan Lee and Steve Ditko. Laura Ziskin, Avi Arad, and Matt Tolmach are producing the film in association with Marvel Entertainment for Columbia Pictures. The Amazing Spider-Man is the story of Peter Parker (Garfield), an outcast high schooler who was abandoned by his parents as a boy, leaving him to be raised by his Uncle Ben (Sheen) and Aunt May (Field). Like most teenagers, Peter is trying to figure out who he is and how he got to be the person he is today. Peter is also finding his way with his first high school crush, Gwen Stacy (Stone), and together, they struggle with love, commitment, and secrets. As Peter discovers a mysterious briefcase that belonged to his father, he begins a quest to understand his parents’ disappearance – leading him directly to Oscorp and the lab of Dr. Curt Connors (Ifans), his father’s former partner. As Spider-Man is set on a collision course with Connors’ alter-ego, The Lizard, Peter will make life-altering choices to use his powers and shape his destiny to become a hero. 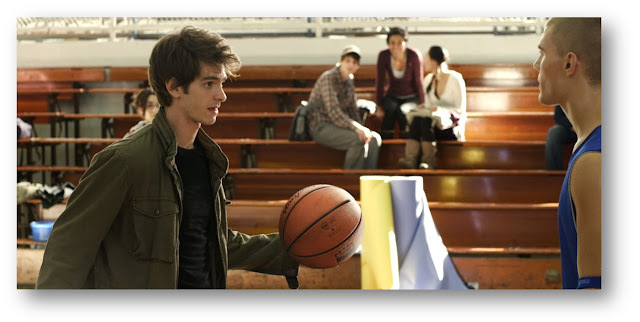 The AMAZING SPIDER-MAN opens on July 3.